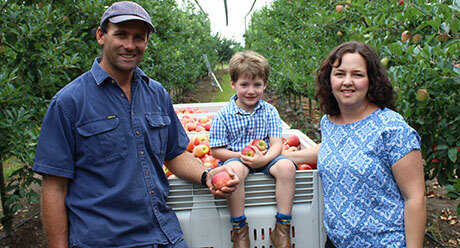 Daniel Nicoletti, a third-generation apple producer from Queensland, has been managing Nicoletti Orchards for seventeen years along with his wife Toni. The orchard’s fruit is sold through the major supermarket chains and the Brisbane markets. With such demand and stringent product requirements, Daniel is active in finding new solutions to old techniques to build the orchard’s productivity. One of these new solutions was to address the issue of hail damage in some seasons and inadequate water levels in others. Daniel has installed hail netting across the entire orchard to guarantee that neither the trees nor the fruit will be damaged, and has invested heavily in above and below ground water solutions to ensure water security. About 70 per cent of Nicoletti Orchards’ fruit is sold through the major supermarket chains, so staying abreast of new technologies, such as automated pickers and anti-bruising handling equipment in the packing shed, produces the high-quality apples these chains demand. Daniel and his wife Toni have also tried to maximise returns by converting some of their second-grade fruit into apple juice and cider. The apple and ginger juice adds value to what was previously a waste product, and is then sold to boutique outlets that retail it at farmers markets across Brisbane and Stanthorpe. Daniel is passionate about the growth of Australian horticulture. He is involved with the Stanthorpe Apple Committee, currently serving as a spokesperson and was previously Chairperson from 2000-2012. Daniels endeavours to increase land productivity, improve quality and implement new technology onto the property has earned him a nomination in the Productivity category.